2011 - what will it hold? We have had two guests visiting with us over the Christmas week. They went home this morning, but will be returning for another few days a week from now, while their 'humans' are away on holidays. and one thinks she is!! It's hard to believe that Odin and Nipper were actually brothers - Odin was a definite throwback to the border collie whereas Nipper is very much a springer spaniel. here of my boys and their fiances. Hope everyone had a very happy Christmas! I certainly did...my family was all home and a few friends thrown in for good measure and a grand time was had by all. We're still eating leftovers, but that is fine by me! You will notice yet another change with my blog - it's a work in progress. I'm not at all sure that I'm liking the current change, but we'll see. My favourite flower is the poppy so I thought it would be a good background - just not so sure about the colours I've put with it. Any ideas? EDITED TO ADD: Well, the poppies didn't last long and now I'm trying this one instead. The picture today is of the gift I gave to a friend who loves to knit. She has a gorgeous shawl she wears over her winter coat and was lamenting one day that she didn't have a shawl pin to hold it in place. 'Aha', said I, and began a search for one. Well, this town didn't haven't a CLUE what I was talking about. I was met with total blank stares. Obviously my quest was going to be a fruitless one. Hmmm. So to the internet I went, hoping that I could order one for delivery in time for Christmas. Nope. My stash yielded up some copper wire which I bent somewhat into the shape I wanted. Then I hammered it flat (making my husband come running wondering what on earth I was doing). A quick dip in a warm water/lemon juice/salt bath made it all shiny again, and voila - a one-of-a-kind shawl pin. The colour in this picture just doesn't do it justice. Do you think I should take up business?? At this point you can freeze it if you like. Bake at 350 degrees 40 mins. Jack made this several years ago. This little fellow makes me feel happy. - Cathy has a lot of crazy quilting on this one. 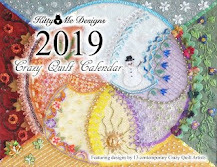 - Emmy (Cramzy) does a variety of fun stitching projects here. - Doreen from Creative Meanderings is a multi-faceted artist & is always fun to read. Her sense of humour comes through! - Dabbled - a mixed bag of things, most of which are interesting and fun. 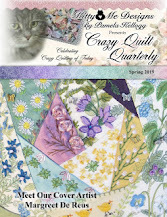 - Debra Spincic also discusses a variety of things - lots of quilting. - Jackie of Dog Daisy Chains - what can I say? Her work is one of a kind and oh so inspiring. I was lucky enough to win one of her pieces awhile ago and it is one of my treasures. - for the genealogists amongst you, I enjoy reading Genealogy by Cindy. I have quite a few more on my reader and eventually I will post them all here. Maybe you will find a few new ones to add to your favourites! - Judi has an interesting site that quite often shows her latest art dolls, along with lots of other fun things too. - Susan Lenz is a perennial favourite of mine. Her work is SO inspiring and so very different. - Vero posts about her sewing and garden (with a few interesting trips thrown in). - I know I've told you about Allie Aller before and I never tire of seeing her stitch work. Craft Gossip; Craftzine; and Craftside. Have fun with those and in a day or so I'll be back with a few more. Today a new visitor arrived! Don't forget - if you want to see the latest updates on the dolls, please check out our blog here. (The latest pictures of my doll Anneelaw are on there now!!). Angels we have heard on high? Yesterday and today I've been busy creating these little charmers. 24 of the little white ones and the four coloured ones you see here. The white ones are from the 'Littlest Angels Kit' put out by The Beadery. There were several pieces left over and I combined some of the bits in my stash to make the coloured ones. These are little presents and/or 'bows' for the top of parcels. Every year I make a number of ornaments and some of my friends have collections! While I was cleaning out the things that belonged to Dad I came across both his wedding ring (broken) and my mothers' engagement ring. I already had Moms' diamond placed into the new ring I got on our 25th wedding anniversary (it has my engagement diamond and a sapphire, along with the diamond from Mom). Gold is expensive right now, so I decided I would put the rings, along with a couple of other ones I had, together and have a cross made - so that I could wear a piece of all three of us. This was made by a local jeweler - didn't she create something lovely? I gave her free rein to do whatever she pleased with it and I'm so glad I did! There was enough gold left over that I was able to sell it and pay for half of the chain I'm getting to go along with it. I don't have much 'good' jewelry, so this is pretty special. btw - the red showing at the bottom of the cross is a reflection from my shirt! Yes, I messed my studio up today!! Her body is a petit-point box measuring about 3x4". more music in her life. "Let Us Have Music For Piano"
and an idea was formed. I copied the first few bars of 'Rigoletto' (La Donna e mobile) by Verdi onto fabric and made her a collar with some beads as embellishment. She liked that very much. So I stash dived and made her arms - using some coiled wire with more beads - plus copper wire inside for strength. Now she has arms AND legs and she's pretty happy. for us to use as a journal for Raisa. I used the first few bars of 'Rigoletto' again, along with a copy of the words. More stash diving yielded the lace flower and the word 'music'. There's a tag in behind the words that has my info. More of the music from 'Rigoletto', a piece of turquoise ribbon and some music charms. The quote is from Maya Angelou. Hope you like what I did Yvonne! wooden clock that a friend gave me a few years ago. I've acquired. I have yet to try it out! My trusty Janome is at the ready! there's something new there periodically. In a former life this little unit was red. See the little sewing machine? If there's anything you'd like a better look at, let me know in the comments and I'll try to get a close up. The room isn't quite done yet - the trim needs to go down around the baseboards, but it will have to wait until after Christmas. The cabinet I keep my iron on is also destined for a paint job in the new year. Hope you've enjoyed seeing my new space. NOW I CAN GO AND MESS IT UP!!!!! (or at least part of it!!). The above pictures are the 'befores' that I took just before I began painting. The walls were a soft purple and the furniture was green. OK, but not something that might be advantageous to attract any potential buyers! If you have a look in my sidebar under 'studio tour' you can see more 'before' pictures. I will show you the 'new' studio in two posts, one today and one tomorrow. There are a number of pictures and I wouldn't want to either bore you OR overload your computer!! The colours here aren't exactly 'true' - envision a lb. of butter and you have the wall colour. This is just inside the door. The dresser holds my crazy quilting fabrics, pretty much sorted by colour. The cabinet to the left holds my beads and there is more fabric storage below. My bookshelf, being guarded by my dragon! You can just see my 1950's sewing machine. cabinet below - all yard sale finds! This is beside the door in the other direction. high enough for me to use in comfort. The plastic unit below holds my laces and trims. Well, the basement reno is moving along and today the new carpet was installed. It looks really nice and certainly brightens up the space considerably (the old carpet was dark brown and this is a pretty taupe). The only problem is that I have a physical aversion to the smell of new carpet and my trips down to my studio (which is right next door to the freshly carpeted area) are going to be sadly curtailed until the smell leaves the premises. I don't know why it is, but I get decidedly light-headed when I'm in carpet stores and sometimes in fabric stores too. Just a quick reminder - Dolores and Leone? I need your snail mail addys so I can sent out the magazines you 'won' yesterday...thanks. Mary Corbet of NeedlenThread reminded me of a lovely piece of needlework that, if it gets enough votes, might be headed into space! Go here to check her post and then place your vote. Wouldn't it be something if a piece of stitching went into space? While you are at Mary's site, don't forget to look around. She never fails to have something interesting to share about stitching.